Created by Stan Lee & Jack Kirby, Thor first appeared in 1962's comic Journey Into Mystery #83, a sci-fi anthology published by Marvel Comics. Based on the Norse deity of the same name, Thor is the God of Thunder and possesses Mjolnir, an enchanted hammer. A year later, Thor was included in The Avengers #1 as a founding member of the team, and the character has since appeared in every subsequent volume of the series. As a result, Thor has become one of Marvel's most popular and enduring superheroes, featured in countless comics, animated series, video games, and live-action films. Played by Chris Hemsworth, Thor has appeared in five Marvel Cinematic Universe movies - including Thor, The Avengers, Thor: The Dark World, Avengers: Age of Ultron, and a cameo at the end of Doctor Strange. His latest cinematic outing, Thor: Ragnarok, looks to set a new standard for not just the Thor series, but the rest of the MCU as well. Directed by Kiwi filmmaker Taika Waititi (of Hunt for the Wilderpeople, What We Do in the Shadows), Thor: Ragnarok finds the son of Odin in a race against time to prevent Ragnarok — the end of the universe — at the hands of Hela (Cate Blanchett), the Goddess of Death. After Hela destroys his mighty hammer, Thor must summon the warrior within and surmount impossible odds in order to save his people from total annihilation. Joining him in his quest to cancel the apocalypse are the all-seeing Heimdall (Idris Elba), the fierce Valkyrie (Tessa Thompson from Creed, HBO's Westworld), and Loki (Tom Hiddleston), Thor's silver-tongued half-brother. But first, the Asgardian prince must survive a deadly gladiatorial contest against a friend and fellow Avenger who was last seen rocketing into outer space aboard a Quinjet at the end of 2015's Avengers: Age of Ultron. After crash-landing on Sakaar – a scummy junkyard planet surrounded by wormholes – Thor is captured by scavengers and taken to serve as a gladiator for the planet's eccentric ruler, known as the Grandmaster (Jeff Goldblum). In a move inspired by 2006's Planet Hulk comic storyline, Thor is forced to compete in the Grandmaster's "Contest of Champions", where he must face the current reigning champion – the green-skinned goliath known throughout the universe as the Incredible Hulk (mo-cap Mark Ruffalo). After beating some sense into his friend, Thor convinces the Strongest Avenger™ to join him in saving Asgard from Hela, Skurge the Executioner (Karl Urban), and the fire demon Surtur (voiced by Clancy Brown). After a solid start with Kenneth Branagh's Thor, the burgeoning Thor franchise took an Iron Man 2-level nosedive with Alan Taylor's underwhelming follow-up, Thor: The Dark World. While Iron Man bounced back with Iron Man 3 and Captain America flourished with his own trilogy of films, Thor was left behind; a character that, like Hulk, seemed best utilized in team-up movies. Enter Taika Waititi, a native New Zealander known for incredibly funny character-driven films. As an actor, writer, & director, Waititi's unique vision provides a much-needed shift in tone and a rejuvenated sense of fun in Thor: Ragnarok. An amalgam of Star Wars, He-Man and the Masters of the Universe, and Big Trouble in Little China, Waititi's fast-paced cosmic rock opera deftly blends laughs and levity with powerful emotional moments. Established characters like Thor, Loki, and Hulk are further developed while new players like Valkyrie, Korg (an alien rock gladiator voiced by Waititi), and the Grandmaster expand the potential for new stories in the MCU. There's a real sense of pathos with the characters here. 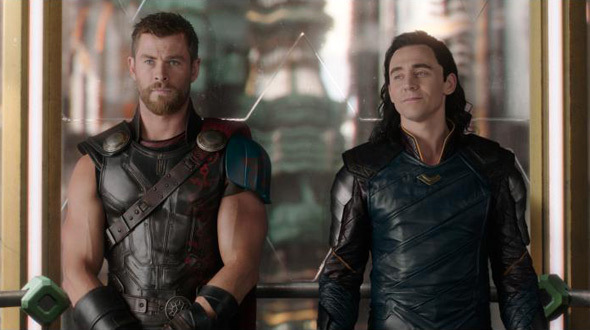 Even when the movie is laugh-out-loud funny, there are moments of melancholy that provide a counterbalance to the levity, bringing gravity to an otherwise slight standalone adventure by showing the toll loss can take on our heroes, and how even the darkest hearts – like Hiddleston's mischievous Loki – can be affected by witnessing the end of their own civilization. The performances are fantastic, and the screenplay by Eric Pearson, Craig Kyle, and Christopher Yost, while simplistic in its narrative ambitions, delivers exhilarating action sequences and memorable character moments that are executed flawlessly by Waititi. Of course, it also helps that Waititi assembled a talented team behind the camera, including production designers Dan Hennah (The Lord of the Rings and The Hobbit trilogies) and Ra Vincent (What We Do in the Shadows), cinematographer Javier Aguirresarobe (The Road, The Others), and costume designer Mayes C. Rubeo (Avatar, Apocalypto). Ragnarok might be the most eye-popping Marvel film to date, second only to James Gunn's Guardians of the Galaxy movies. Influenced by the psychedelic comic book illustrations of Jack Kirby, the film is filled with vibrant worlds and colorful characters that make you feel as if you've fallen through a wormhole and into another dimension. Composer Mark Mothersbaugh's synth-laden score captures the vibe of '70s and '80s sci-fi fantasy films effortlessly. Throw in a few select needle drops from Led Zeppelin, and you've got the cinematic equivalent of a Shaggin' Wagon, tricked out with shiny sidepipes, plush shag interior, and an airbrushed mural of wizards, fire-breathing dragons, and sword-brandishing barbarians on the side. In other words, it's totally bitchin'. It isn't as heartfelt as this summer's Spider-Man: Homecoming, nor does it take full advantage of Cate Blanchett's talent in the way Homecoming uses Keaton's, but these deficiencies didn't detract from my overall enjoyment of this Thor film. I can imagine some will find the movie too funny, impossible to take seriously. But why would you want to take a movie this amusing and irreverent so seriously? It'd be like watching What We Do in the Shadows and expecting Interview with the Vampire. Thor: Ragnarok is a heavy metal, Viking adventure – a pure blast from beginning to end that is as fun (and funny) as it is dazzling and imaginative. While this feels like it could be the last Thor standalone movie in the MCU, I hope it isn't the last time Taika Waititi works on a film of this size and scope. Like Gunn, his voice stands out amongst the homogeneity of the modern blockbuster and provides something that is fresh and inventive. (And go watch all of his other previous films while you're at it.) See this movie on the biggest and loudest screen possible, and prepare to enter the majestic halls of Valhalla!